Australian abstract painter Ildiko Kovacs was born in Sydney in 1962. Her formal art education began in 1978 when she achieved her Art Certificate at St George College, Sydney leading to further study in 1979-80 for her Higher Art Certificate at Sydney’s National Art School. In 1980, Kovacs travelled across Europe, absorbing the artistic culture of museums and art galleries before returning to Australia to begin her painting career. 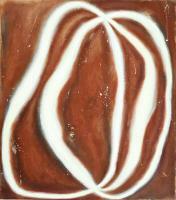 In 1986, Kovacs began exhibiting with Garry Anderson who helped nurture the early career of the young artist. 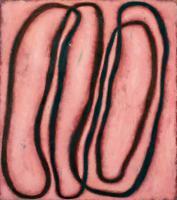 After Anderson passed away in 1991, Kovacs held solo exhibitions for nine years in Sydney. Throughout her career, IIldiko Kovacs has enjoyed great support from people such as committed art collectors Colin and Elizabeth Laverty, Hugh Jamerson and the late Sydney gallerist collector and arts patron, Ann Lewis AO. In 1995, Kovacs journeyed across Australia, eventually settling in Broome. This trip proved fundamental in moving her concentration from European and American paintings, to the Australian landscape and artists. Spurred on by her new influences, Kovacs enjoyed a renewed confidence and clarity of vision for in her painting. 2005 saw Kovacs’ line works with brushes give way to the artist’s experimentation with rollers, creating a new mark-making process. Kovacs’ abstract paintings are expressive movements and unstructured artistic portrayals of colour and line. Her more recent works indicate a progression in her craft to a liberated and lively form of mark making that draws its influences from both Indigenous and Western painting traditions. Rather than paint for a show, Kovacs says she constantly creates work to further explore and refresh her practice and relationship with materials, colour and line. While her paintings are abstract in character, Kovacs says she regards herself more as a contemporary artist who is building upon historical traditions, artistic influences and her own experiences. Kovacs’ paintings rely on gesture to express the communication of a physical act as it relates to bodily movement. Core aspects of the artist’s craft are her processes of layering, building and removing paint over time. Kovacs applies the paint to plywood boards using paint rollers, which she says allows her to “get across the board in one gesture and work quite fast”. Working at speed, often using her hands to apply paint to the roller, Kovacs creates works that bear her hallmarks of spontaneity, movement, rhythm and energetic expression. Kovacs speaks of “feeling the colour and intuiting the composition”, something that she achieves by launching herself with vigour into the creation of her paintings. Kovacs’ works are intensely personal and emotional and are created with intuition and trust in herself as an artist and in her medium. Sometimes a painting is wiped clean, peeling back the layers and repainted until the artist finally ‘connects’ with the image. Kovacs begins her compositions based on colour and rhythm. Once satisfied with the colour and tone, Kovacs adds in the line. “I sculpt the line, rubbing sections away, drawing up other lines until there is fluidity, a naturalness,” she says. When she is creating a painting, Kovacs eschews the easel for the floor, allowing ease of movement both around and above her work to engage with and “feel” the picture from many positions. 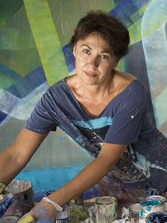 Ildiko Kovacs is widely regarded as one of Australia’s leading abstract artists. 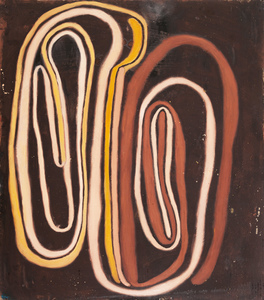 In 2011 she had a major survey show in Sydney featuring works produced across three decades and on loaned from prominent public and private collections. She has won many awards over her career and her works are held in collections in most major institutions throughout Australia and many internationally.